There are several elements involved in marketing your business. You have to make sure that you’re communicating with the right people at the right time, the way that you communicate has to be on-brand, and you have to ensure that your content is actually being seen. With so much involved, it can be easy to gloss over some basic things that will help your brand to stand out. 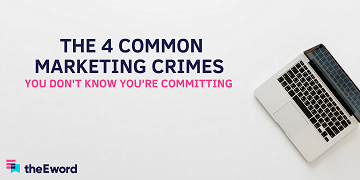 If you’re looking at your marketing plan and scratching your head, thinking of ways to improve, a good place to start is by checking whether you’re guilty of one (or more) of these four common marketing mistakes. It’s always a good idea to prompt your audience towards doing something. Whether it’s making a purchase or reading more information, you should push your readers along the buyer’s journey. CTAs are an effective way to make your audience do something, especially when you pair them with the use of positive language. But add too many and you’ll make your landing page look spammy, like one of those annoying pop-ups that make your computer crash – and no-one wants that. Each CTA should be representative of the stage that the reader is at in the buyer’s journey, and it should be used in a way that appeals to your target audience. You don’t want to be shouting at an awareness-stage user, telling them to buy a product that they don’t even know they need yet. It just doesn’t work. Your audience members are the ones who will be parting with their hard-earned cash, and it’s your job to create a compelling argument as to why they should. Your CTAs should be reflective of the argument that you make in your content, and should not direct the reader towards an action that they are realistically never going to do. You might be running a great social media campaign, your content might be on point, and you might have compelling paid ads all running at the same time, but if they don’t work together, your marketing efforts won’t produce results anywhere near as strong as they could be. It’s important to integrate your campaigns to make sure that they function collectively as parts of your overall strategy. If your business has different departments running different campaigns, you should make sure that each campaign is working in a way that complements the others, integrating your marketing efforts to create one structured campaign. Whether you communicate online, offline, or both, you should keep the messaging the same, because this can cause inconsistencies in your branding, which will be confusing to your audience. Building a brand can be expensive. It’s all about capturing a feeling and expressing it through the various ways that you communicate with your target audience. Writing is branding, and it’s important to get the tone of voice right. Time and money spent on visually appealing brand designs will go to waste if the wording of your content doesn’t match up to the way that you want to be perceived by your target audience. Make sure that your copy is written on-brand and without grammatical errors. The idea is to speak the same language as your target audience, and to put your message into terms that they will understand. If you’re a professional business, your tone of voice will be formal but should still have that human element (because you’re still selling to human beings). If, on the other hand, your product is a theme park aimed at children, you will want to communicate in a fun way that’s appealing to them as well as their parents. Messaging is key to turning your content into revenue. Social media is a powerful marketing tool for any business. It has the ability to place your content (and thereby your products) in front of your target audience at the time that you want it to be seen. It involves little maintenance and gives your readers a taste of your brand. One mistake that many businesses make is create social media accounts on every platform and push their messages out to as many people as possible. Although this might be successful in some cases, it’s the digital equivalent of spray-and-pray marketing. When you’re pushing your message out on social media, you have access to a range of insights that will help you build brand awareness with the right people. It’s all about defining your target market and working out which networks they use. You can save time and energy by only targeting the appropriate networks, and this is time that you spend crafting an inspiring campaign that reaches the right audience at the right time – an audience that will eventually convert. If you’re a law firm that deals with big business clients, for example, your time would be wasted trying to reach your audience on Snapchat; you would be better off targeting potential clients on LinkedIn, where they are actively looking for a business like yours. By making a few tweaks to your marketing efforts, you will give your business a well-rounded strategic boost. If you’re on the hunt for a digital partner to bring your efforts up to speed, but you aren’t too sure where to start, take a look at our guide to choosing the right digital agency for your business.